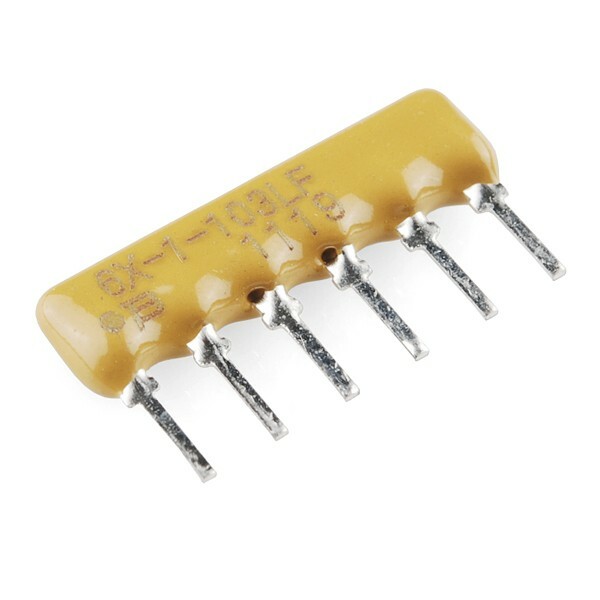 If you ever find yourself connecting handfuls of resistors to the ground bus of your breadboard, you may consider these SIL-packaged resistors as a time-saving alternative. This Singe In-Line component is actually 5 individual 10K Ohm resistors that share a common terminal on pin 6 (denoted with a black dot). These work great as current limiting resistors for rows of LEDs and two of these can replace 10 individual wire-lead resistors when hooking up our 10 LED bargraph displays. They also work well as pull-down resistors for DIP switches.